Contents: Deck of 108 cards. Gameplay: Each player is dealt seven cards. Play moves round the table, with players taking it in turns to put a card on the discard pile. 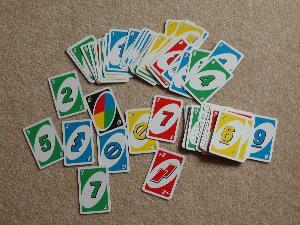 Most of the cards have a number and a colour on them. For a card to be played it must match the top card on the discard pile in either number or colour. There are various special cards that force the next player to take extra cards, miss their go or use a particular colour. The direction of play can also be reversed. If a player can't go, they must take another card from the deck. The round is won by the first player to get rid of all their cards. They're awarded a score based on the cards remaining in the other players' hands. A few extra rules complicate matters. Some special cards can only be played under certain circumstances, there are penalties for mistakes and players can (very occasionally) bluff. Object: To be the first player/team to score 500 points. Game length: A round tends to last between five and fifteen minutes. Getting to 500 takes hours. Number of players: 2-10. Four players is probably the optimum, though. Reverse and miss-a-go cards can be confusing with fewer players. I suspect that many more players would make the game feel slower and more random. Age: 7+. Children a little younger may be able to cope but will struggle to begin with. Comments: Sprog1 got this for his birthday and entirely ignored it. A dull-looking card game wasn't very enticing compared with driving Mario around a kart track at high speed. Despite this, I sneaked the game on holiday with us. Both boys complained that they hadn't packed it and it wasn't anything to do with them. On the second morning, I got up to discover Sprog1 sitting still and quiet at the table with the cards in front of him. Sprog2 dragged himself into the lounge at 8am, groaning slightly from lack of beauty sleep, and collapsed on the sofa. 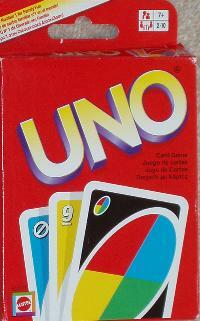 "Do you want to play UNO?" asked Sprog1. "Urg. Not now. Uh..." answered Sprog2. Sprog1 was not pleased. "But I've been sitting here for twenty minutes waiting for you to get up and play!" Although it can be initially bewildering, UNO really isn't that complicated once you get going. There's not much strategy to it but it does require plenty of concentration thanks to the fast pace. This makes it much more interesting than other games with a large element of luck. Nonetheless, even younger children have a chance of winning. Whatever each player does always affects the next player's options, so there's plenty of interaction and rivalry. That said, it's next to impossible to gang up on people or play vindictively. As such, UNO is an ideal family game for train journeys and summer holidays. Conclusion: Beats the heck out of Junior Scrabble. Can be played in short bursts. Works with a wide spread of player ages and numbers. A full game lasts a while. Might take over your world. Try the ''not ANOTHER mention of High School Musical'' High School Musical Uno for girls. Splat.